My cat Catali­na keeps me up at night, meow­ing and wan­der­ing back and forth over me, look­ing for our oth­er cat Spike, who died last fall and with whom she’d been togeth­er since kit­ten­hood. I have two, and they hap­pened close togeth­er. When Big Mom­ma Makes the World had its launch in Lon­don, the Lon­don plan­e­tar­i­um was filled with chil­dren, and some­one nar­rat­ed the text while Helen Oxenbury’s amaz­ing art was pro­ject­ed onto the plan­e­tar­i­um ceil­ing. The lights all went out when Big Mom­ma made the dark, and then the stars filled the sky. At the end of the book the Lon­don Gospel choir sang, and all the chil­dren waved the bal­loon sculp­tures and swords in time to the music. 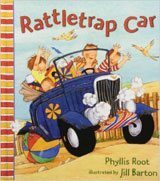 Not long after, I vis­it­ed a school on the Nava­jo reser­va­tion where my daugh­ter was vol­un­teer­ing and read Rat­tle­trap Car to all the class­es at the school. Back in the trail­er where she stayed, I was help­ing my daugh­ter pack when one of the lit­tle boys from the school, maybe six years old, burst in, saw me, cried, “Bing Bang Pop!” and laughed and laughed. Sel­dom has a book of mine received such a joy­ous reac­tion. A Babar book, writ­ten in long­hand rather than type­set, in the book­mo­bile that came at the foot of the hill where we lived. Bas­ket­ball. Unless there’s a medal for read­ing. I no longer have a tele­vi­sion, so this one is hard to answer. 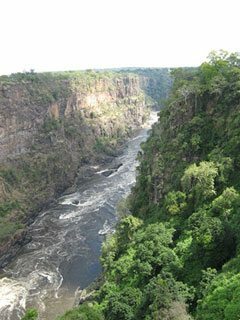 I watch a few shows on my lap­top once in a while, and the one I watch most is the Rachel Mad­dow Show. Oh, what a great expe­ri­ence with Big Mama. I wish I could have been there. Were you able to attend? 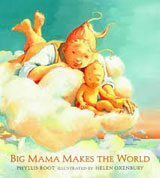 I love Big Mama — such a won­der­ful read aloud. Con­grats to you for all you’ve done and will con­tin­ue to do.